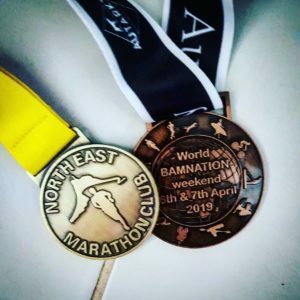 This is a 4 lap marathon route around the Druridge Bay Country Park (a 2 lap half marathon is also available) organised by North East Marathon runners . The route includes a run on the beach and sand dunes, passing the large freshwater lakes and surrounding meadows, plus a section through woodland. The route includes some closed roads, sand and trails and is mostly flat. There are two feed stations supplying water, juice and sweets on each lap. In the end she came away with 5 hours 23 minutes and so smashed even her gold target. Well done Nicole! Nicole looks to have had a lovely day out, with the family supporting and was awarded two medals for the effort. She also commented: ‘I now know I hate running on sand…so that’s me out of the Marathon des Sables…’, but do we believe her??? Link to full results here. Two medals for one race!! !